The contest. That was the term Bobby Riggs liked to employ. The contest – the thrill of playing for money, even if but for a dollar here, five dollars there, on to thousands more. The action, the competition; but not the gamble, oh no, not the gamble. Because, as accurate as “Battle of the Sexes” is in capturing the spirit of Bobby Riggs, one thing it gets wrong: He was not a gambler. Bobby Riggs was a hustler. Gamblers do stupid things. They show up in Las Vegas and toss down thousands on the roulette wheel. What do they even know? Hustlers know. Bobby always knew, always was aware what it was going to take to win. If you’re Lornie Kuhle, owner of what he’d call a doctorate in Riggsology, you know this deep in your bones. Kuhle in 1973 was a 29-year-old teaching pro. He’d already known Riggs for more than a decade, having first met him when Kuhle was an 18-year-old from Decatur, Illinois, a youngster from a working class background, keen to learn more about the tennis world. Soon enough, Kuhle became as close to Riggs as a son. In “Battle of the Sexes,” he is a constant presence, be it when Riggs is gleefully taking down wealthy men, training to play Margaret Court, not training to play Billie Jean King, Kuhle courtside in Houston to handle everything from wardrobe counsel (the Sugar Daddy jacket) to trying to make supplemental bets mid-match. But 1973 was hardly the end of Kuhle’s time with Riggs. “Bobby Riggs lost that match by the score,” Kuhle told me. “But he also won. He became a worldwide celebrity. Everywhere he went, people wanted to play tennis with him.” They also wanted to do business with him. Nabisco, delighted with the exposure Riggs had given Sugar Daddy, paid him $50,000 a year for a decade. Kuhle remained in the thick of Riggs’ life, often accompanying him on these trips. 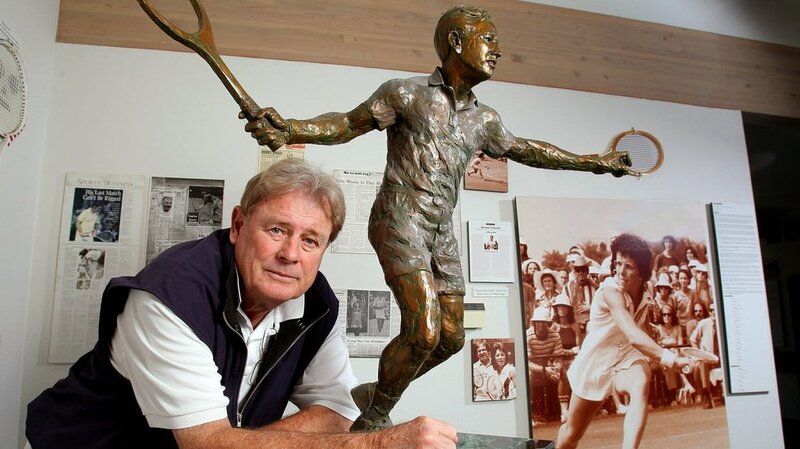 In time, Kuhle would serve as the executor of Riggs’ estate and also run the Bobby Riggs Tennis Club, a facility in the San Diego area that would feature a Kuhle-created tennis museum filled with memorabilia, not just from Riggs, but from all eras of tennis history. “Bobby Riggs was a master promoter,” Kuhle told me. Before King was even born, Riggs had successfully bet on himself to win the 1939 Wimbledon singles, doubles and mixed doubles titles. Eight years later, as the world’s number one player and promoter of the pro tour, Riggs signed the number one amateur, Jack Kramer, to a pro contract – in large part creating the traveling retinue that would pave the way for Open tennis 20 years later. As Kuhle sees it, “Riggsology” is the ability to be street-smart, attuned to the odds, adept at seizing an opportunity. Certainly all that surfaces in one of Kuhle’s latest ventures. He is the tournament director of the USTA National Girls 18s and 16s nationals. “Guess what?” Kuhle said this past summer. “Billie Jean is teaming up with Bobby Riggs again to help this tournament. It all ties in.” A year short of the 100th anniversary of Riggs’ birth, let the contest continue.